If you've been considering trying out Swag Bucks, now is definitely the time. New joiners automatically get 30 Swagbucks, plus, they're offering special incentives to celebrate their upcoming birthday. 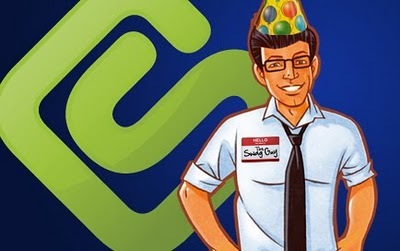 Click here to find the Swag Bucks site, and use the code BirthdayDeal for an extra 50 Swagbucks. That makes 80 total! The Swag Bucks Blog is also advertising the code BirthdayFun for an additional 25 Swagbucks. I would try the 50 buck code first, but maybe you can even stack them for the extra 25? Just to give you an idea of how I use Swagbucks, check out this link to my January Swag Hints post. I've been a member since December and I am now up to earnings of $50 worth of Amazon.com gift cards. With Easter and a certain 4 year-old's 5th birthday coming up, I won't have to worry about finding the money to buy presents!